This is a small area (155 acres) located in Mims. 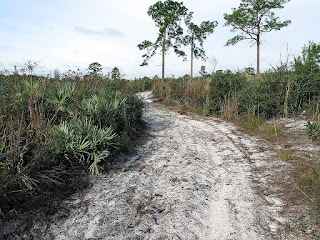 It is made up of scrub, scrubby flatwoods, depression marsh, cleared trails and sandy roads. 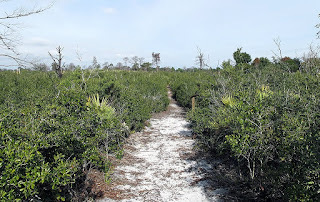 The sanctuary was donated to Brevard County as mitigation land and is managed by the EEL Group http://www.eelbrevard.com/. There are approximately 2 miles of hiking trails/roads. 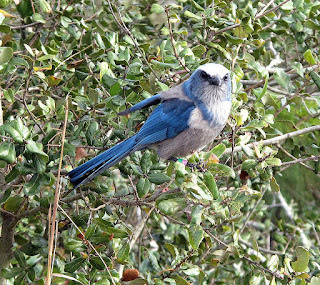 There are a number of scrub jay families living in the sanctuary, some relocated from the Melbourne Area. All trails are marked with arrows to assist you in finding your way around when hiking there. It is just about impossible to get lost in the sanctuary because roads and private property border it. There is only one access point with parking and that is located off Ford Road at N28 38.434 W80 52.583. There is an information kiosk there, with a layout of the sanctuary, along with trail maps. 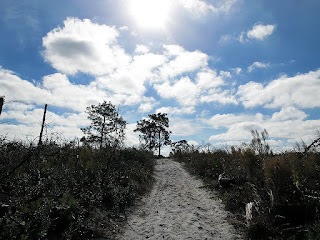 As you walk around the trails you will encounter small sand hills and pass some depression marshes. The main area is just scrub, with a scattering of pine trees here and there. Along the edges you will encounter other types of trees. I am told that there is a nice variety of plants and wildlife in the sanctuary. The day I walked around I encountered a few families of scrub jays. Like most scrub jays I have encountered, they were very friendly, trying to land on my hat and camera. They are a lovely bird so please respect and protect them. Be forewarned it is against the law to feed scrub jays, you could be fined up to $200 if caught. 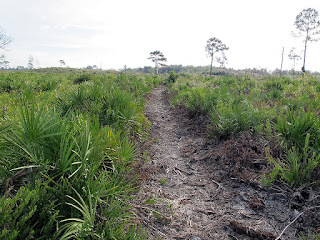 The main trails are just sandy roads, but the EEL group has cleared some trails through the scrub that are very nice. There is no hunting in the area, so that is nice. There are many prescribed burns scheduled for this area, that could block access at any particular time. All in all I recommend that you take some time and visit this sanctuary. It is mostly very open so a cloudy day might be the best time to plan a visit. I walked every trail, discovering some very nice sites as I stopped and looked around. As always, please leave nothing but footprints and take nothing but photos. Please consider carrying a small plastic bag to use to pickup any trash that might have been dropped by someone else. 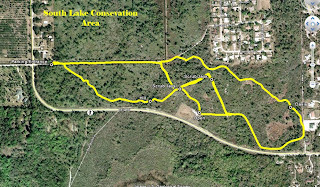 View my trails map - WIKILOC South Lake Conservation Area Hiking Trails> To learn more about using WIKILOC downloads, other areas, GPS’s etc, use search box in this blog for keywords like Wikiloc, Google Earth, GPS or an area name. Great site. 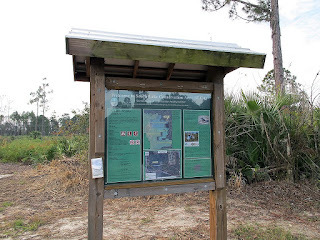 Thanks for a wonderful resource for local hikers!